Ductless air conditioners first appeared in the marketplace in 1973. They were initially developed as an upgrade to the window unit to provide cooling to specific areas of homes or businesses. 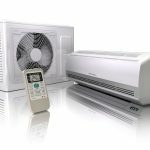 Ductless systems offer more efficient and cost-effective cooling, allowing you to control the temperature from room to room as opposed to the singular temperature provided by conventional central air conditioning systems. Ductless air conditioners are often referred to as split or multi-split systems and provide numerous benefits. Ductless air conditioners have come along way since they were first introduced. In 1982, VFR (variable refrigerant flow) units were introduced which could provide both cooling and heating. Unlike traditional heat pumps and central air conditioning systems which deliver warm or cool air through a myriad of ductwork, ductless heating and cooling systems consist of a small outdoor unit with one or more indoor units. These indoor units essentially create zoned climate control, making a home or business more comfortable. 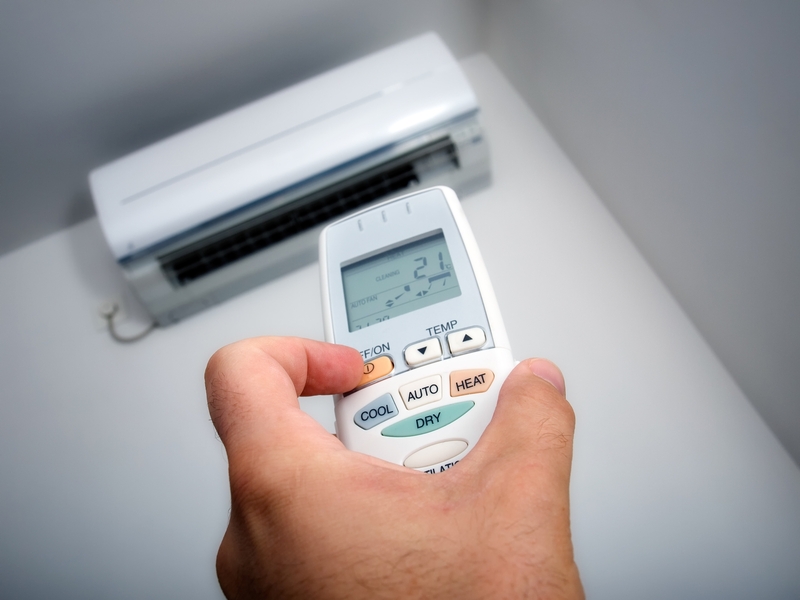 Smaller than traditional forced-air systems, ductless air conditioners use less power. They are highly efficient because the temperature-controlled air is delivered directly into a specific room or area. Also, the “zones” these ductless systems create reduce energy consumption by only heating or cooling rooms as necessary. Because these units don’t require any ductwork, they are easy to install. The indoor units are streamlined and unintrusive. Typically mounted near the ceiling, out of a person’s sight line, they require nothing more than a three-inch hole for the pipe connecting it to the outdoor unit as well as access to electricity. This makes ductless air conditioners the perfect solution for both existing structures and new construction. They eliminate the loss of square footage and, in existing structures, they eliminate interior wall reconstruction. 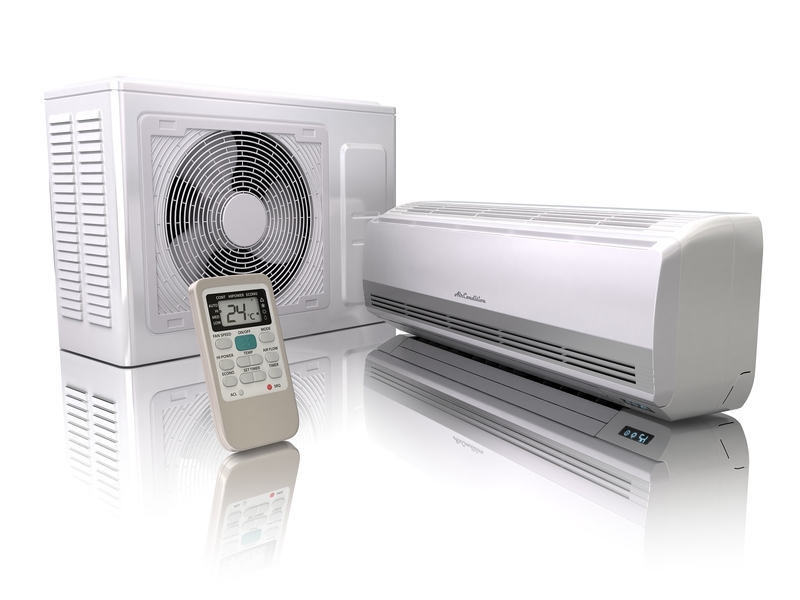 Mitsubishi has remained at the forefront of the ductless air conditioner industry. Mr. Slim offers even more benefits than previous ductless systems. The Mr. Slim series offers ductless heating and cooling systems as well as cooling-only systems. 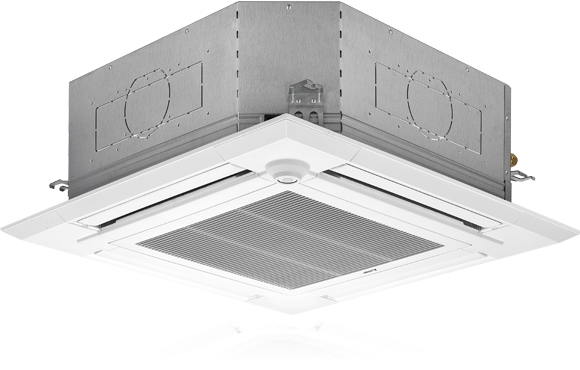 Some of the highlights of the series are Variable Compressor Speed Inverter (VCSI) technology, ceiling concealed units and 4-way ceiling cassette. 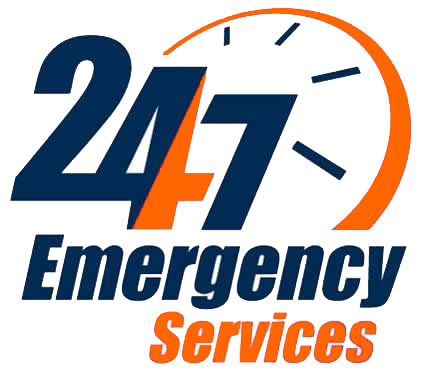 With traditional heating and cooling systems, the compressor runs full force until the desired temperature is reached and then turns off. This creates temperature fluctuations and wastes energy. Mr. Slim’s variable compressor speed inverter continually monitors the room’s temperature and adjusts the compressor speed accordingly. As a result, Mr. Slim reduces energy consumption by up to 30 percent. The Mr. Slim series includes ceiling-concealed indoor units. 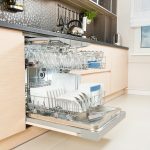 This innovation makes it simple for you to mix and match multiple units to fit your needs and work with the layout of your home or office without detracting from the decor. Because of the ductless technology, installation is easy and up to eight indoor units can be installed and connected to a single indoor unit. This provides each room with customized temperature control. The ceiling cassette blends seamlessly with any type of interior. It provides a horizontal airflow which spreads just below the ceiling before slowly descending to ensure pleasant air conditioning in the room without creating any draughts. Probably the most unique feature of the cassette is its precise person recognition. The cassette is equipped with a total of eight sensors which rotate completely around the room through a full 360°. These sensors work with a smart algorithm to calculate the number of persons in the room and their position. The output is automatically adjusted to the occupancy of the room. 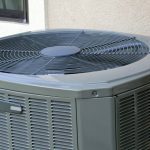 Ductless Air Conditioners – Are You Ready for an Upgrade? 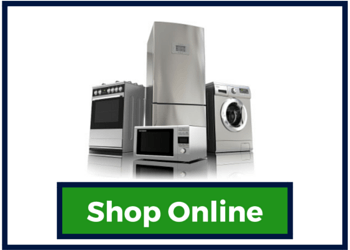 Jersey Coast Appliance is an authorized dealer of Mitsubishi ductless heating and cooling systems. Their systems are energy efficient, environmentally friendly and completely customizable. 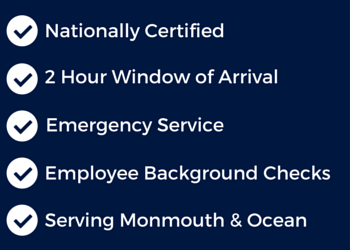 They offer home and business owners the ability to cool and heat specific areas to the exact temperature desired, providing consistent and exceptional year-round comfort. Contact us or visit one of our convenient locations and talk to one of our experienced sales staff to find out if a Mitsubishi ductless system is right for you.